The Milwaukee MS 305 DB Sliding Compound Mitre Saw has a powerful 1,800 Watt direct drive motor with constant power technology. Its unique inline motor design allows for excellent visibility from both sides to the work piece and better balanced transport. 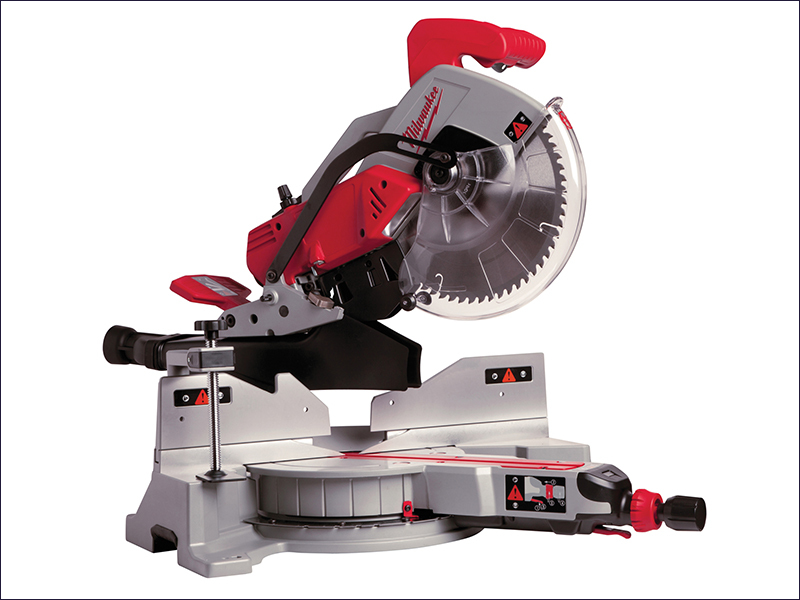 The saw has a mitre angle digital readout, providing repeatable accuracy to 0.1°. An integral dust channel captures 75% of all dust and debris cut by capturing the dust near the cut on both sides of the blade and directing it to the back of the saw. Dual integral jobsite lights fully illuminate the work piece and cut line from either side of the blade. The MS 305 DB has a mitre capacity of 55° to the left and 60° to the right, with mitre detents at 0°, 15°, 22.5°, 31.6°, 45° and 60° on both sides. The dual-bevel design allows the saw head to be inclined left & right 0° - 48° with bevel detents L & R at: 0°, 22.5°, 33.85°, 45° and 48°. A unique single lever bevel adjustment provides fast and accurate bevel adjustment. Supplied with workpiece clamp, saw blade (60 teeth), vacuum adaptor Ø 35/58 mm, wrench and 3m cable. Capacity: 90/90°: 102 x 342mm, 90/45°: 57x 242mm, 45/90°: 102 x 241mm, 45/45°: 57 x 241mm. Blade: 300mm x 30mm Bore 48 Tooth.